Snow Park in Goa is one of the most loved tourist destinations to experience the best enjoyable moments of life. The excitement of snow parks in Goa has reached to such an extent that whenever someone talks about the must visit places in Goa, Snow parks are proudly rated at the top. There obviously exists plenty of attractive sightings inside the city for the visitors including the glorious sea beach, temples, churches, beautiful falls, historical forts, caves, casino to name a few. But the undiscovered charm of snowfalls inside the city is yet to be discovered and explored to such an extent which can even be capable enough to virtually visualize the experienced enjoyment inside the place despite being present at some other place as well. Snow Park in Goa must be visited by the tourists prior to planning the journey to this glorious city so that entire visiting infrastructure can get mapped inside the minds of visiting persons and the undiscovered charm of Snow Park in Goa can initially be experienced online. We are dedicated to providing unlimited snow based fun and enjoyment including the experience of best sporting activities in Goa as well via snow parks. Snowpark facility provided by us has achieved unlimited success in gaining the visitor’s attraction in the shortest time duration and consistent positive feedback. There exist multiple attractions inside the snow parks along with unlimited fun and enjoyment to the visitors. Children are given special priority with enjoyable and adventurous live snow games. 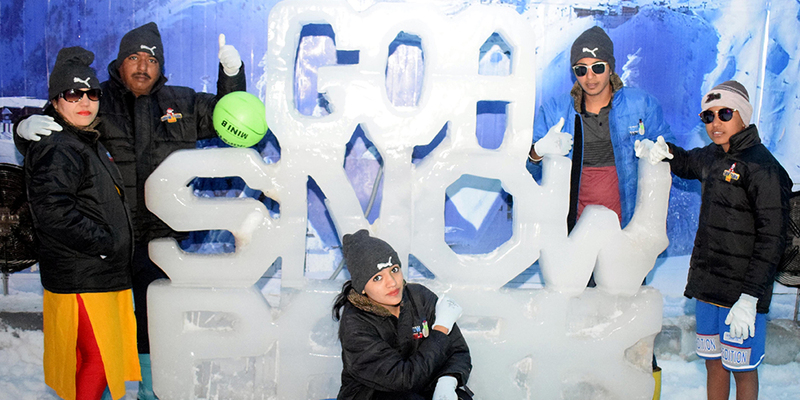 Playing with real snow in the least temperature of even -5 degree temperature, experiencing igloos, Eskimo adventure, ice sliding, DJ dance enjoyment in the snow along with marvellous thundering effects including glorious laser lighting adds more excitements. Unlike all the remaining amusement park in goa concerning snow parks, we make a difference by preferring to serve the drinks to our visitors in real ice glasses. Selfies with the ice glass with snow falling backgrounds feel amazing. Snowball fights inside the park arena magnetize the visitor’s interest. Noticing the people’s interest in the specific game of enjoyment, we have included the dedicated provisions of complete safety and security for different age group people as well as the female visitors. Following our complete dedication towards the essential sets of enjoyable services, we are consistently gaining positive feedback over several online platforms including blogs, social media, forums etc as well as being benefited with mouth to mouth publicity as well. The internal temperature maintenance of minus ten degree makes the visitors feel to be in Switzerland like snow city. More than 250 visitors are at a time accommodated at the place due to large land area coverage of the snow park. We humbly instruct our visitors to wear warm clothes while visiting and enjoying this one of the best attractions in Goa as well as committed to providing a pair of boots, jackets and gloves also. The wall inside the snow park is constructed using the fiber glass giving an effect of snow fall. Amazing lightening techniques inside the place gives an amazing experience to the visitors while visiting inside the snow park.